If you're looking to find some sweet deals or just want to have a good time, the Richmond Night Market is the place for you. With over 300 booths to pick from, chances are you won't leave empty-handed. They have hats, clocks, T-shirts, cell-phones, video games, CD's, toys, even underwear. Don't make the mistake I did-forget your wallet. Luckily, my Mom felt sorry for me and gave me 10$ dollars to spend. I know it doesn't sound like much, but 10 bucks goes a long way at the night market. Coleman got himself six beyblades for 2$. That's unheard of. Usually one beyblade costs 12$. Jen bought a pair of big sunglasses for 5$. Why she did that I'll never know; she's already got at least five pairs. I nearly bought the new Harry Potter book. It only cost 2$. The only problem is I'm still reading the first book. If you time it right, you can catch one of the live performances. I saw these kendo drum guys who were so synchronized it was incredible. Trust me the Richmond Night Market is awesome, not just for finding deals but the experience itself. If you go, you'll be glad you did. I've never been to S.E. Asia, but this is what I imagine it to be like: lots of stalls selling everything under the sun and lots of people shopping. The Richmond Night Market is an experience that takes you out of your everyday life into something completely different. You get to see Asian culture and taste Asian foods without going all the way to the Orient. The Richmond Night Market is popular. Lots of people go. If you don't like crowds, I'd go right when it opens at 7:00 PM. 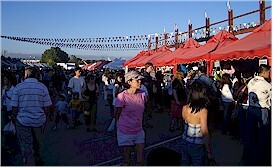 The Richmond Night Market is located at 8351 River Road, Richmond and is accessible by the Canada Line skytrain. Website: www.richmondnightmarket.com. Also check out the Chinatown Night Market.